These dogs are not recommended for apartment life and would do best with a mid-to-large sized yard. They need space. They are not really active indoors, but need regular exercise outdoors. A fence is a must as they may wander away in search of the borders to what they believe is their territory. Puppies are very active and might have the tendency to wander off or escape. Prefer cool climates. Regular brushing of the long double coat will keep it in good condition, but extra care is needed when the dog is shedding its dense undercoat. The outer coat does not mat unless there is a burr, foxtail or some other outside object that gets stuck to the coat. This can be an issue for outside working dogs. Some owners choose to shave the coats in the summer to avoid this from happening, but beware of sunburn. Bathe or dry shampoo only when necessary. 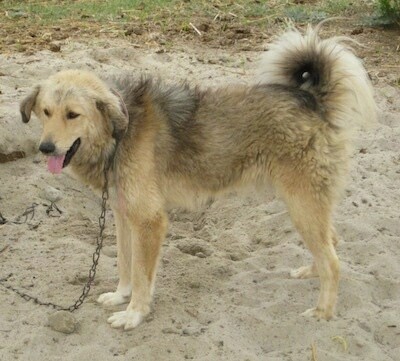 The Bakharwal Dog is an indigenous breed of Himalayan origin and was bred exclusively by a Muslim nomadic group called "Gujjars" to protect their livestock from predators like wolves and bears. This breed traces its origins to the Pir Panjal Mountain range of the Himalayas and today Jammu and Kashmir (Hilly State in North India) is predominantly the stronghold of this breed. Many variations occur in this breed as the pure gene pool gets diluted by the time they reach the plains of India. Legend has it that the breed was developed in antiquity by crossing a wolf to some kind of sheepdog dam.